Oran Kearney praised his depleted Coleraine team for picking up all three points in their opener against Warrenpoint Town. Kearney was without a full team of outfield players due to injury, suspension and family commitments. 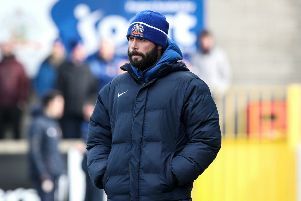 The Bannsiders boss included five Academy graduates in his squad, handing debuts to Ben Moore and Alex Gawne. And he was impressed with the young lads’ contribution coupled with that of the senior players, including fellow debutant Graham Crown, who completed a transatlantic dash in the early hours of Saturday morning to make kick off at The Showgrounds. “The whole time I’ve been at the club I don’t remember a day like today in relation to the amount of players we had missing,” said Kearney. “We have 20 professional players at the club, Lyndon Kane is out long term injured, James McLaughlin is coming back from a long-term injury, we have two goalkeepers - which takes us down to 16 players, and out of that we had about eight players missing. It was a crazy scenario to find ourselves in. “A big part of that is the five players who were walking a tightrope going into the Irish Cup final, they were booked in the final but then are punished three months later. “It’s a rule I’ve never agreed with, last season is last season, it’s history now, people should start the new season with a clean slate. “We haven’t moaned about it, we have just got our head down and planned accordingly. “I have to give great credit to everyone today. The two young lads - Ben and Alex - dug in and put in good performances. “Ben got it a bit tight in the first half, but he showed resilience and character and came strong in the second. “Alex’s energy and enthusiasm was brilliant throughout, he was a real outlet for us. But those guys don’t get that platform unless your senior guys are on it. “Eoin Bradley, Stephen Lowry, Ciaron Harkin, Gareth McConaghie, Josh Carson playing in at left back, Darren McCauley. “Graham Crown flew overnight from America, he arrived in Dublin in the early hours of the morning and then played like that today after missing most of pre-season. “It was one of those days when we needed all those guys to have a bit of adrenaline, and stand up and give the young players the platform to do that. Then you have Chris Johns behind that to pull off several good saves when called upon. “I knew it was never going to be the smoothest of days. We knew they would have chances and we would have to ride a wee bit of luck. Warrenpoint boss Stephen McDonnell was frustarted with the goals his side conceded on the day. “We certainly thought there was an opportunity to get something, whether that be the points or a performance, but we didn’t take that opportunity and it’s a bit disappointing,” he said. “I felt we done well in the first half an hour and should have capitalised on the one big effort we had, but the three goals we conceded are basic, basic human errors. It wasn’t tactics that beat us today it was just sloppiness on the individuals’ behalf. “That is a concern, although we created six or seven chances but in fairness Coleraine have the best goalkeeper in the League and that was difference in both ends. “It’s a concern that we created so many chances without taking one, but moving forward we need to cut out individual errors.